We’d love your help. 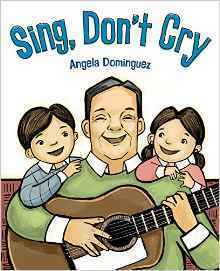 Let us know what’s wrong with this preview of Sing, Don’t Cry by Angela Dominguez. Once a year, Abuelo comes from Mexico to visit his family. He brings his guitar, his music---and his memories. In this story inspired by the life of Apolinar Navarrete Diaz---author Angela Dominguez's grandfather and a successful mariachi musician---Abuelo and his grandchildren sing through the bad times and the good. Lifting their voices and their spirits, they realize tha Once a year, Abuelo comes from Mexico to visit his family. He brings his guitar, his music---and his memories. To ask other readers questions about Sing, Don’t Cry, please sign up. First book of the year! From the author of Mary Had a Little Llama, a Pura Belpré honor book, this is a tale based on the author’s life story of growing up away from her abuela. Nice illustrations, neat endpapers. Based on a popular Mexican song and inspired by the author's grandfather's life as a musician, it follows the joys and sadness of three family members and how songs can soothe the soul through good and bad times. What a beautiful message and heartfelt story. The panels tell three separate stories while carrying a positive message of finding gratitude in situations and relying on family who loves you. A great contribution for the call for diversity as well. Text to Text- Sing, Don't Cry reminds me of the book, Drawn together. Drawn together and Sing, Don't Cry are books about different generations connecting with each other. Drawn together focuses on grandpa and grandson having a language barrier and Sing, Don't cry focuses on music bringing grandpa and his grandchildren closer together. Grandpa says, "Sing, don't cry because singing gladdens the heart." Grandpa talks about the distance that is between them and how he only gets to visit once a year Text to Text- Sing, Don't Cry reminds me of the book, Drawn together. Drawn together and Sing, Don't Cry are books about different generations connecting with each other. Drawn together focuses on grandpa and grandson having a language barrier and Sing, Don't cry focuses on music bringing grandpa and his grandchildren closer together. Grandpa says, "Sing, don't cry because singing gladdens the heart." Grandpa talks about the distance that is between them and how he only gets to visit once a year from Mexico. Grandpa says, "Sing, don't cry because singing can attract someone to sing with you." Singing with grandpa is what connects him with his grandchildren and Drawn together resembles art as the bridge to bring together grandpa and grandson. Text to self-Sing' Don't Cry is similar to my life because as a child I didn't get the chance to visit my grandparents too much because of distance. We too had our own special bonds just like the little boy and his abuelo. "Once a year, my abuelo would come visit us from Mexico to stay with us. He always brought his guitar and he would sing to us." Text to the world-This book reflects on the real world because there are lots of people (families) who live long distances from one another. In the book, grandpa says, "Singing made the distance seem smaller." Singing will keep the bond strong and "gladden the heart." Dominguez, Angela (2017) Sing, Don't Cry. New York, NY: Henry Holt and Co.
An Abuelo comes to visit his family each year and shares his wisdom about staying optimistic. Instead of crying he says to sing. This will gladden your heart and things won’t seem so bad. Singing will attract others to you as well. This book has very little text and the reader will have to make a lot of assumptions about the pictures that are illustrated. It has a good message of positivity and there is an author’s note about how the inspiration for the book is from her actual Abuelo. In this warm and wise picture book, Abuelo visits his grandchildren once a year, bringing his beloved guitar. As he plays, he shares stories from his past and passes on advice for life’s difficult moments, structured around the refrain, “Sing – don’t cry.” Backmatter identifies the phrase as a line from a popular Mexican song, “Cielito lindo.” Photographs from the author’s childhood adorn the endpapers, further highlighting the personal nature of this story. Life can be hard, but often losing things means that the door is opened for new and wonderful things to take their place. Abuelo comes to visit once a year and encourages his grandchildren to "sing, don't cry" when things are getting them down because singing gladdens the heart. The simple text belies the intensity of the message, making the book accessible to younger and older children alike for different reasons. Every year, the children's Abuelo (grandfather) visits his family. When he comes, he brings his guitar. He sings songs with the children and shares his memories. He spreads the idea that whenever you're feeling scared or sad, you should sing instead of cry and that will make you feel better. This story was inspired by author Angela Dominguez's grandfather. He made his family realize that whenever they were singing together would experience true happiness. Inspired by the life of successful mariachi musician Apolinar Navarrete Diaz, the author remembers visits with her grandfather and his life advice involving singing through any of the pain that life contains. An author's note follows the text and photos of Apolinar appear on the inside front and back covers of the book. Pencil illustrations finished digitally. PreK-2. 4.5 stars - maybe up to 5 after chewing it over for a while! I really, really liked this book! I like the message - sing, don't cry, even if only in your heart. I loved the illustrations - showing abuelo's story as well as what's happening in the lives of the two children. Basically, it's just a really great book! I think that you should read the informational page on the grandfather before reading this lovely book. My kindergartener, my 80 year old mother and I enjoyed this book. It is about singing when times get tough. I predict that you will love it also. Gorgeous little book with a simple and wonderful message. The pictures do not communicate every part of the story (likely because losing a leg in an accident is a bit much for visuals in a children’s book, but it still sings. This would be great for the little ones who love Coco. This short but powerful text is just right to share with kids who are new to a country or new to a school or simply dealing with bullies. It offers a way to stay strong until things change and get better. In this touching family story, an Abuelo comes from Mexico each year to visit his grandchildren. As they spend time together they realize that they all have endured challenges in childhood. Loosely based on the author's grandfather's life. I really loved this one. The pictures are bold and great. The story and message are great. I just want to look at the pictures over and over. You can see the emotion in the characters pretty clearly. Also, the dust jacket is very nice. Childrens' abuelo (grandfather) visits are filled with song. Singing is one of the ways that they can be encouraged in tough times. I loved the art, and I really liked the author's note. Something about this story really hit me in the heart. A quick little story about the author and her grandfather and the wise words he gave her for when life has you sad. Sweet, lovely picture book with an Abuelo's caring voice, and a suggestion that singing can cure almost any sorrow, bring an end to loneliness, and ease the heart. This story is about how grandpa deals with sad events and disappointment, he sings. A positive message for elementary children and would make a great read aloud. Great story that features immigrants, based on the author's grandfather. Clear, bold illustrations paired with excellent text make this a great choice for storytime. This is a sweet story of family and how music can bring healing and connection. The book is inspired by the lyrics of Cielito Lindo and the author's grandfather. Perhaps it's just sentimentality about my own abuelo, but I thought this was a really sweet tribute with a heartwarming message. The story of how a yearly visit from abuelo springs a lifelong philosophy of singing through good times and bad. "Because singing gladdens the heart." Encouraging words from an immigrant to his family. When things get rough, and they always do, sing, don't cry. And when you lose something, sometimes it makes room for something new and wonderful. Angela Dominguez was born in Mexico City, grew up in the great state of Texas, and now resides on the east coast. She is the author and illustrator of several books for children including Maria Had a Little Llama, which received the American Library Association Pura Belpré Illustration Honor. in 2016, she received her second Pura Belpré Honor for her illustrations in Mango, Abuela, and Me (written Angela Dominguez was born in Mexico City, grew up in the great state of Texas, and now resides on the east coast. She is the author and illustrator of several books for children including Maria Had a Little Llama, which received the American Library Association Pura Belpré Illustration Honor. in 2016, she received her second Pura Belpré Honor for her illustrations in Mango, Abuela, and Me (written by Meg Medina). Her debut middle grade novel, Stella Díaz Has Something to Say, was published January 2018. When Angela is not in her studio, she teaches at the Academy of Art University, which honored her with their Distinguished Alumni Award in 2013.